This manuscript must have been copied from an exemplar that was both mis-bound, and missing some leaves: although it seems to be complete and bound in the correct sequence, there are gaps in the text (Psalms 112, 113, etc.) are missing), and the order of some psalms is in disarray (Psalm 116 follows 149). It has been identified as a manuscript which was in the library at Worcester Cathedral in the early 17th century, and it had doubtless been there since the Middle Ages. 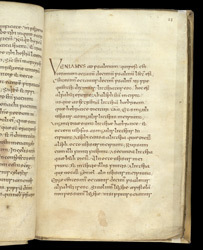 The scribe of this manuscript was aware that parts of his exemplar were missing (or perhaps just illegible) so he left a space on this page in case the text could be inserted at a later date.